More photos of the Castle Ashby gardens are on my recent blog. Would like to have a nap there :))) Beautiful old gardens. He was well-behaved as usual ! But sometimes Lidl plants grow to a splendor, TT. My Tesco rhododendron grows and blooms while others - bought in famous and expensive GC - have still some problems. Exactly! They are happy to survive, so do not make problems. Like people. The Italians seem very good at gardens with water playing and rocky thingies....I watched Monti Don. The arch is very grand. Conker is so good at improving a scene. Even in an Italian garden. I see what you mean !!! They always look SO perfect!! Posed and groomed ;))) Glad you didn't take offence. 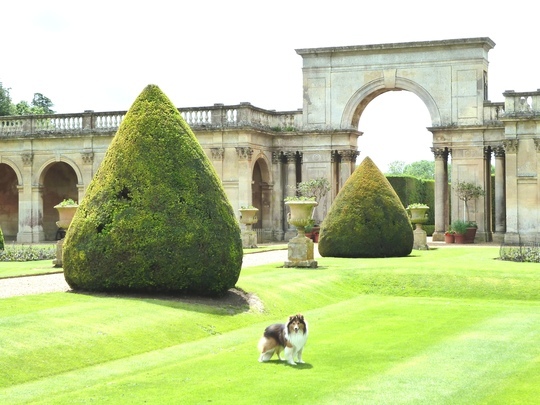 Beautiful architecture Tt, stunning splendour...just the perfect setting for a stroll with Conker! Paul, Janey .. it is a lovely place ... so much to see. It's ALL another TT Hollywood Production!!! LOL. Great pic of a lovely place,Terra..enhanced by "look at me,I'm Conker" Lol. Lovely place and lovely Conker.. So very nice and green! The UK has had lots of rain !!! Thanks for visiting my photo. Castle Ashby gardens are lovely to visit. Just looked this place up on the WWW and it's a lovely place. We reckon about 2 hours drive from here. You're very lucky, lots of rain. There's been no rain here in months...and we won't get any until Nov or Dec. (most likely). .. yet more rain today. He really does look like Lord of the manor there!